An unnamed Apple executive —possibly Chief Executive Tim Cook —allegedly asked Samsung to pressure South Korean antitrust regulators into intensifying their investigation into Qualcomm, with the ultimate goal of reducing royalty payments, according to Qualcomm court filings unearthed on Wednesday. Cook at last year's Sun Valley conference. The Apple executive spoke with a peer at Samsung Electronics at a conference in Idaho, Qualcomm said in documents seen by Bloomberg. The latter person was likely Jay Y. Lee, recently sentenced to five years in prison for a presidential corruption scandal. "Get aggressive," the Apple executive allegedly said, further insisting that the Korea Fair Trade Commission case would be the "best chance" to force Qualcomm to lower prices. The KFTC ultimately hit Qualcomm with a massive fine for its handling of patent licenses and chip sales. Shortly after, Apple launched a lawsuit against Qualcomm claiming the latter withheld almost $1 billion in retaliation. The two corporations are now engaged in a global legal war, including countersuits. The U.S. Federal Trade Commission is pursuing a separate complaint against Qualcomm. "I don't know what conversation they are talking about," Apple general counsel Bruce Sewell told Bloomberg. "For Apple to have said to Samsung, 'You guys are in Korea and you should be watching this case carefully,' doesn't seem to me to be anything beyond simply the kind of conversation two CEOs might have." A critical term of Apple's rebates was that it not push regulators into cracking down on Qualcomm, though it was allowed to answer any questions in existing investigations. The KFTC case had been ongoing since 2014. 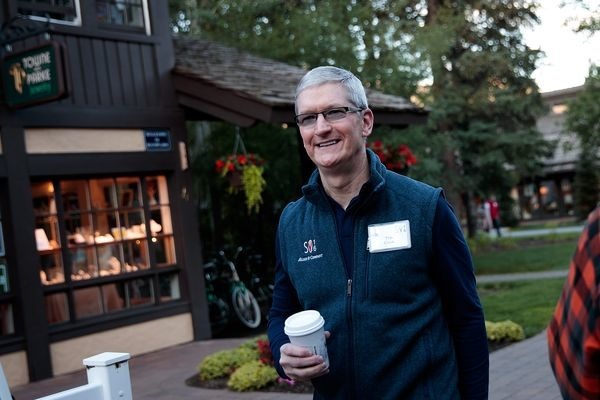 The Apple executive referred to in court filings is almost certainly Cook, since the Idaho conference was presumably Sun Valley, open only to high-profile business executives, politicians, and other celebrities. It's not clear how Qualcomm might have learned the details of a conversation there. The KFTC said that it launched its investigation on its own, and that Samsung was "only one of the companies we enlisted for reference." Apple and other cellphone makers have regularly complained about the amount of money they pay Qualcomm, which both makes wireless chips and holds a wide assortment of patents, including one on CDMA. Qualcomm has been accused of pressuring chip buyers into signing patent licenses at the same time, and exploiting its market dominance to charge high rates. One of Apple's specific arguments against Qualcomm's royalty demands is that it shouldn't have to pay an amount based on the overall price of a device, since the patented technology is related to just one part. The current scheme means that Apple pays Qualcomm more for iPhones with extra storage, even though the cellular modem remains the same. Instead Apple is proposing paying based on the cost of modem. Sewell argued that the company shouldn't owe more than $4 in royalties per device, which would be a dramatic reduction even versus the amounts that were offset by rebates. The counsel further dismissed Qualcomm CEO Steve Mollenkopf's suggestions that a settlement could happen soon, saying it won't happen "absent a complete reinvention of the licensing model that Qualcomm has adapted in the industry."